October 29, 1929, was a dark day in history. "Black Tuesday" is the day that the stock market crashed, officially setting off the Great Depression. Unemployment skyrocketed--a quarter of the workforce was without jobs by 1933 and many people became homeless. President Herbert Hoover attempted to handle the crisis but he was unable to improve the situation. In 1932, Franklin Delano Roosevelt was elected president and he promised a "New Deal" for the American people. Congress created The Works Progress Administration (WPA) which offered work relief for thousands of people. 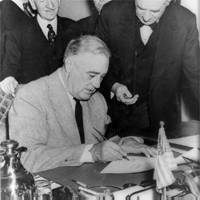 The end to the Great Depression came about in 1941 with America's entry into World War II. America sided with Britain, France and the Soviet Union against Germany, Italy, and Japan. The loss of lives in this war was staggering. The European part of the war ended with Germany's surrender in May 1945. Japan surrendered in September 1945, after the U.S. dropped atomic bombs on Hiroshima and Nagasaki. "The Japanese Attacked Pearl Harbor"
"Professional Golfer Kathy Whitworth Was Born"
"Joseph Stalin Wrote A Memo"
"The United Service Organizations Was Chartered"
"Radio City Music Hall Opened to the Public in New York"
"The Empire State Building Opens"
""Casablanca" Premiered and the Allies Landed Expeditionary Forces in North Africa"
"Civil Rights Leader Martin Luther King Jr. Was Born"
"San Francisco's Golden Gate Bridge Was Completed and Opened"
"George Gershwin Completes the Score for Porgy and Bess"
"The Stock Market Fell To Its Lowest Point During the Depression"
"Senate Passed a Supplemental Lend-Lease Bill"
"New York City's Hippodrome Closed Its Doors for the Last Time"
"The First Prisoners Arrived at Alcatraz Federal Penitentiary"
"The Office of War Information Was Created"
"Closing Night of the WPA Performance of Macbeth"